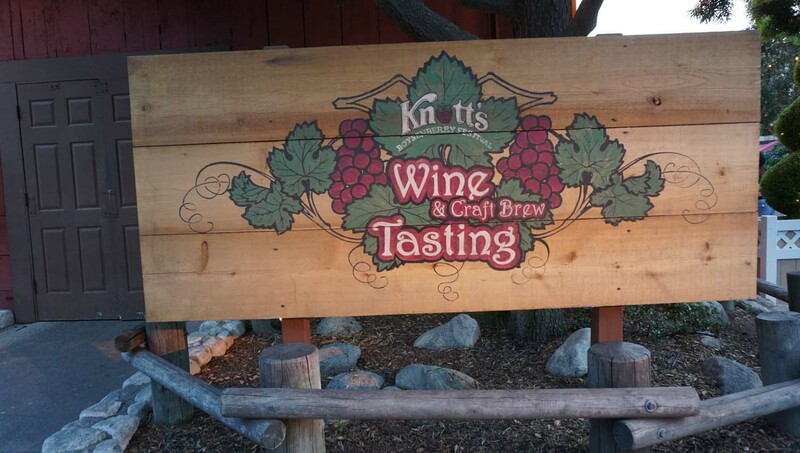 Try Alligator Meat & More - Here's Your Guide To The Knott's Boysenberry Festival - EAT WITH HOP! It's Boysenberry Time! 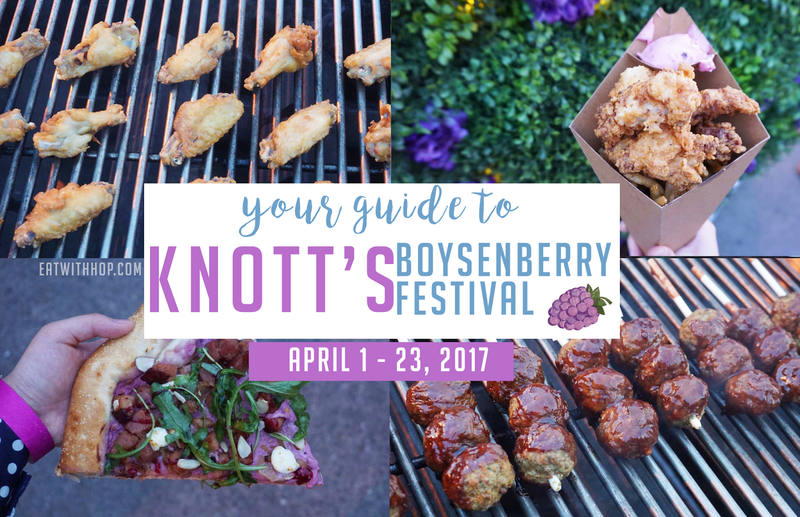 Knott's Berry Farm is having it's annual Boysenberry Festival running from April 1 to April 23! 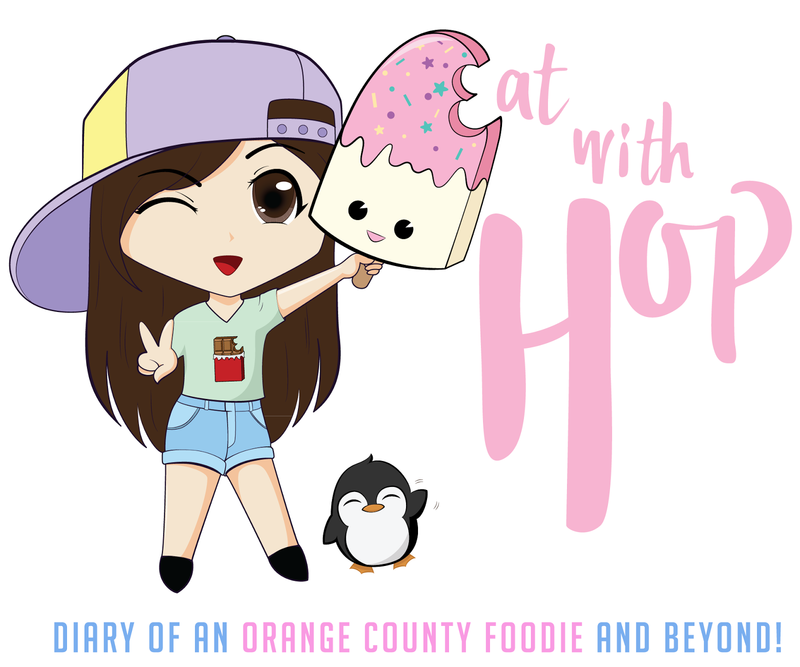 It's an exciting food-venture exploring boysenberry everything from boysenberry chicken wings, meatballs, pizza and even alligator bites! There are so many different things to try and it's amazing that the culinary experts were able to cook up such interesting treats using boysenberry! 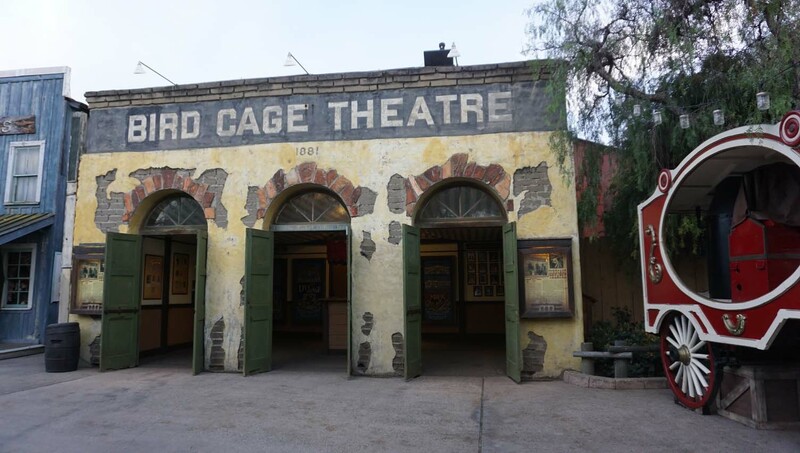 Update: Check out my new Experience Guide at Knott's Berry Farm Boysenberry Festival! 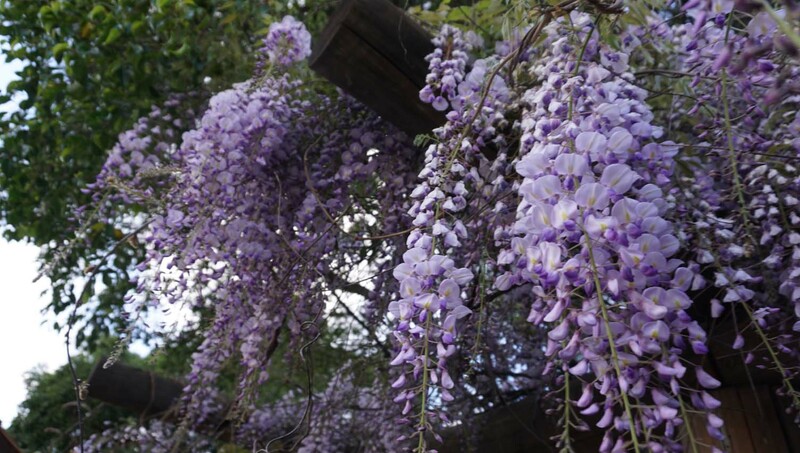 There are such beautiful flowers in bloom! All the famous foodies rollin` out! Boysenberry Chocolate too! POPCORN!?! So many choices! 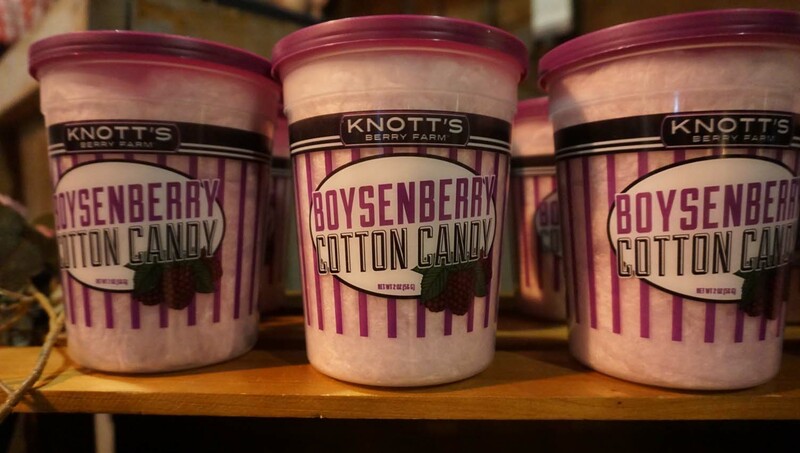 I really like the boysenberry cotton candy! It tastes berry delicious, like literally like boysenberry and is fruity and light! Yum! 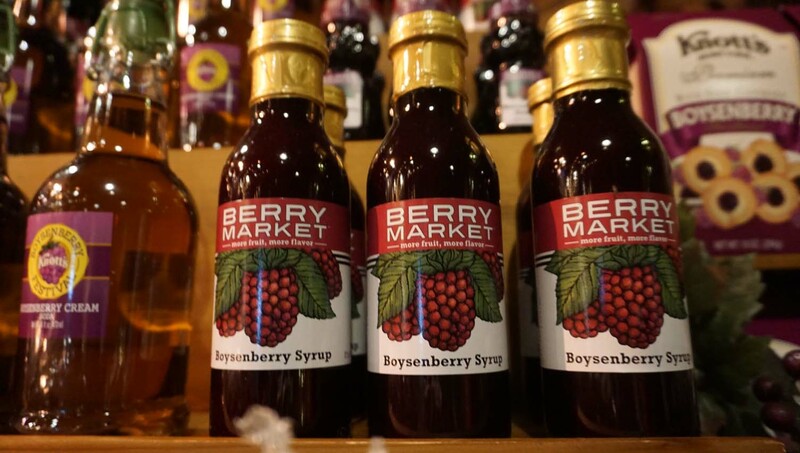 Boysenberry syrup too to flavor your food. Interested? One of my all time favorite snacks from Knott's is the are their cookies! They offer boysenberry flavor which is also very delicious! 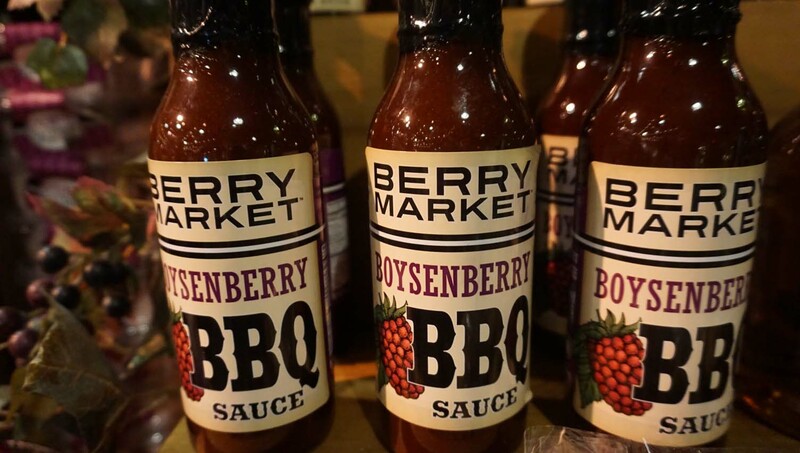 Not gonna lie, their boysenberry bbq sauce is too legit to quit. It tastes great on wings and meatballs and I am sure other things as well! 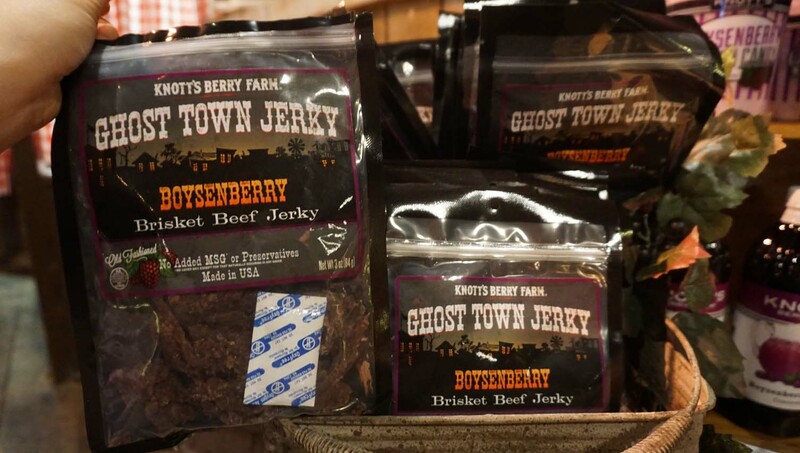 I love the boysenberry beef jerky! It's slightly sweet and soft and not too chewy! 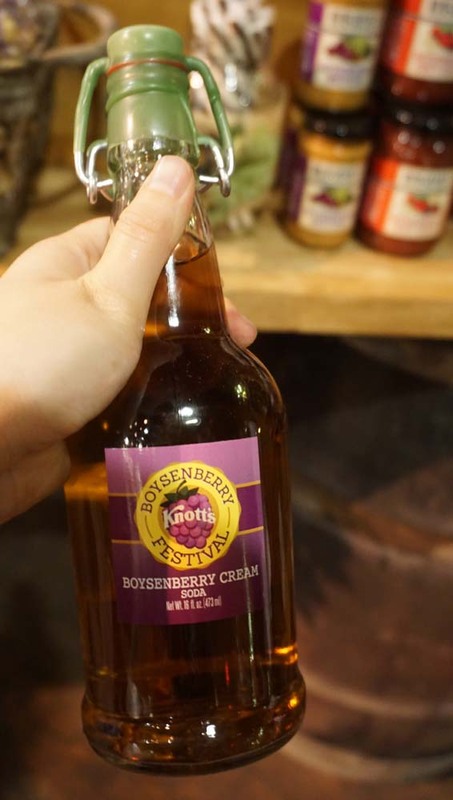 Would you try Boysenberry flavored cream soda? Hands down one of my favorite things to get from the festival: Alligator bites (yes, real alligator meat!) with fries and boysenberry aioli sauce! SO BOMB! 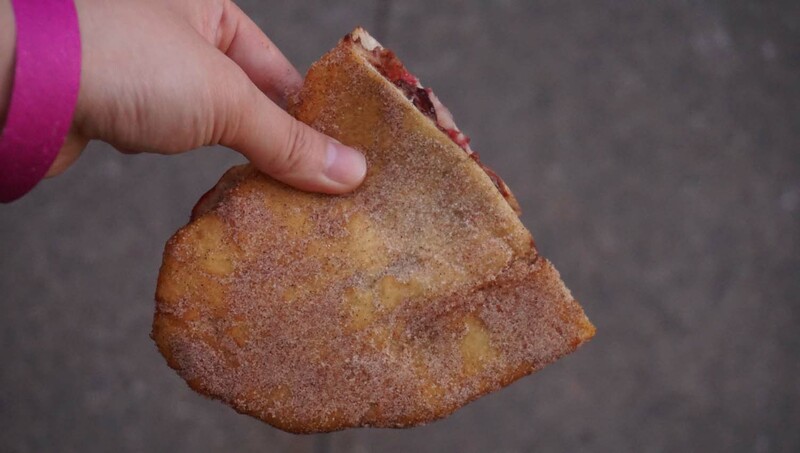 This year, their newest addition to the byosenberry themed food family is the BOYSENBERRY PIZZA! It has arugula and goat cheese! 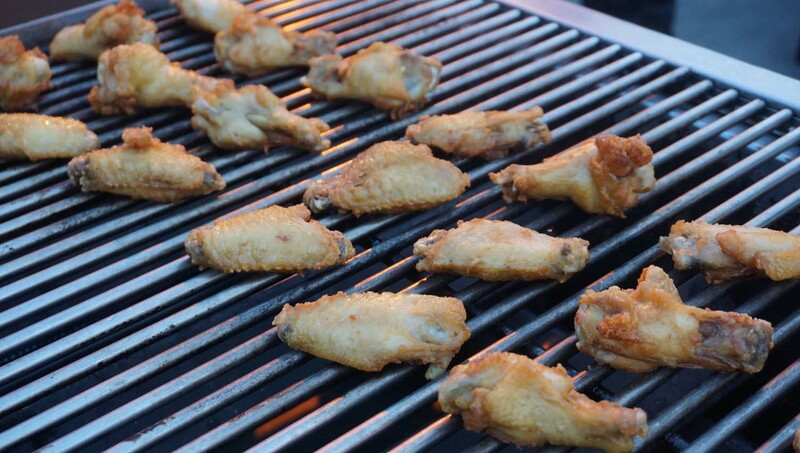 These naked chicken wings are ready to be all sauced up with boysenberry sauce! Here is the pulled pork sandwich with coleslaw and boysenberry bread! There are even boysenberry taquitos!! Inside is filled with boysenberry jam! Indian fried bread with boysenberry jam! 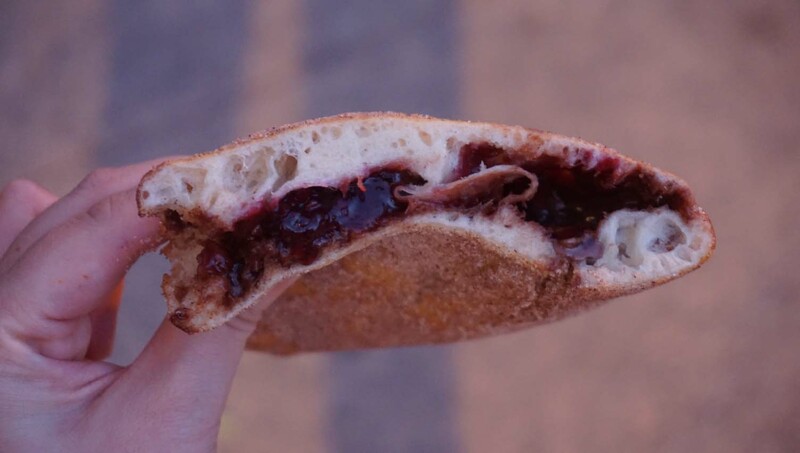 The inside of it is filled with boysenberry jam and super flavorful! This is also ONE OF MY FAVES! 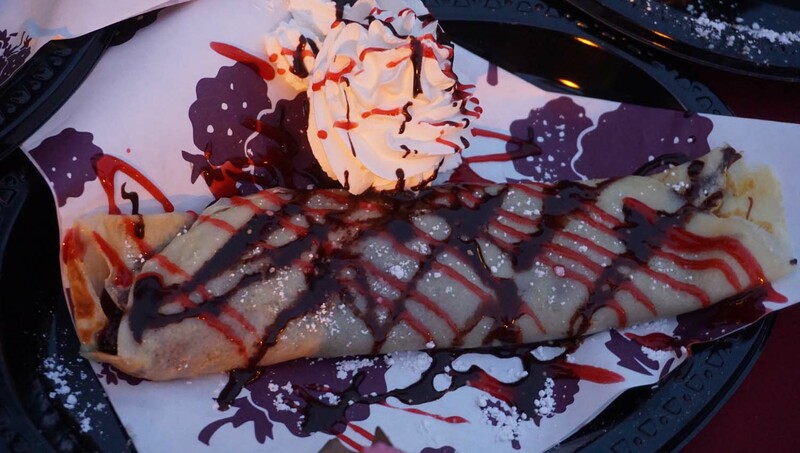 For dessert, they have crepes filled with nutella and cream and also boysenberry syrup all over! Found this picture of BOYSENBERRY Ice Cream Cookie Sandwich with choolate chips from the KBF Facebook! Omg it looks insanely good! There are so many other treats that I haven't tried but it all sounds delicious! 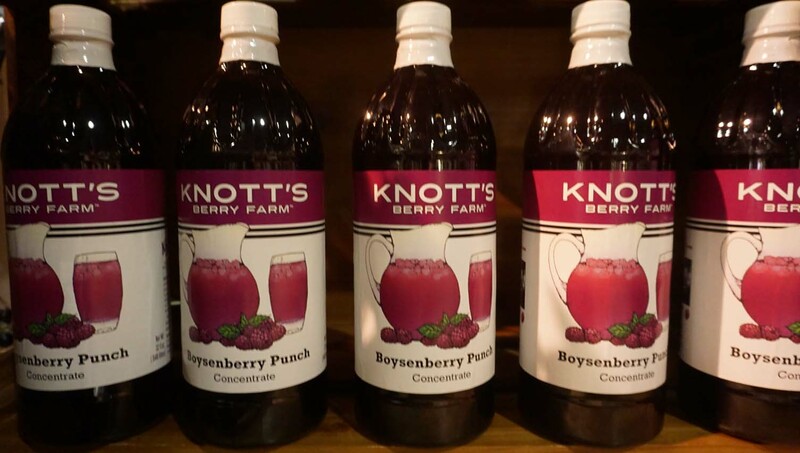 Knott’s Berry Farm is the birthplace of THE Boysenberry! 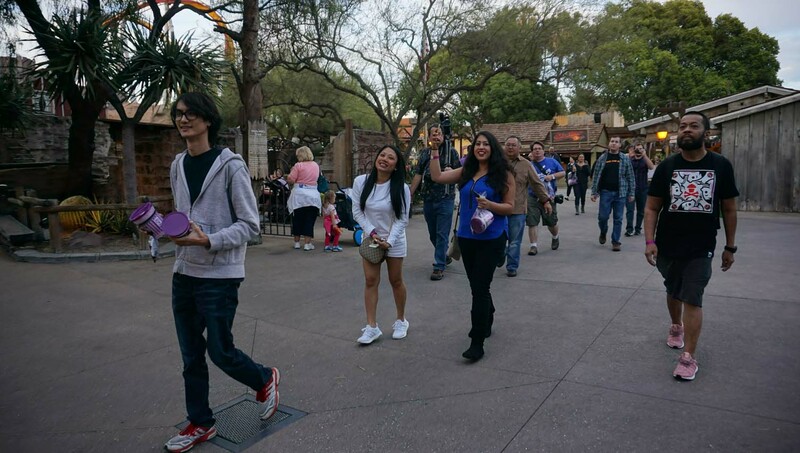 Each spring, Knott’s celebrates the flavorful berry and it historic roots during the Knott’s Boysenberry Festival with unique food and live entertainment. For the first time ever, the mouthwatering festival is expanding to three weeks, April 1 – April 23. 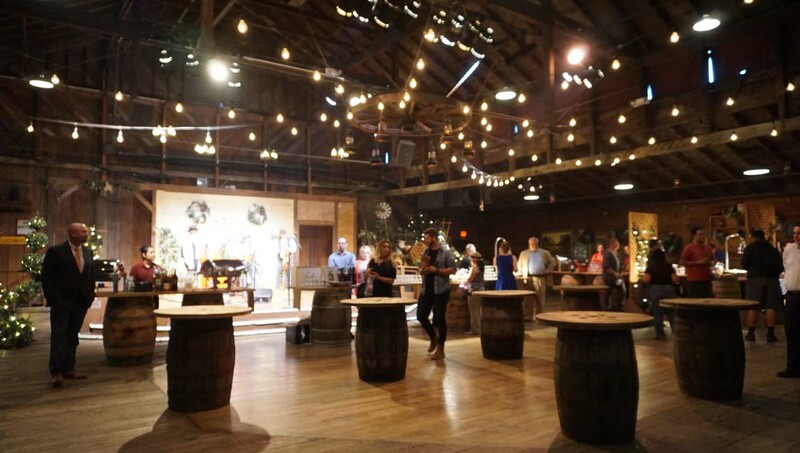 The 23-day food festival features over 80 one-of-a-kind boysenberry inspired dishes, drinks and more, plus foot-stompin’ entertainment, the Wine and Craft Brew Tasting Garden, and family fun everyone will love! 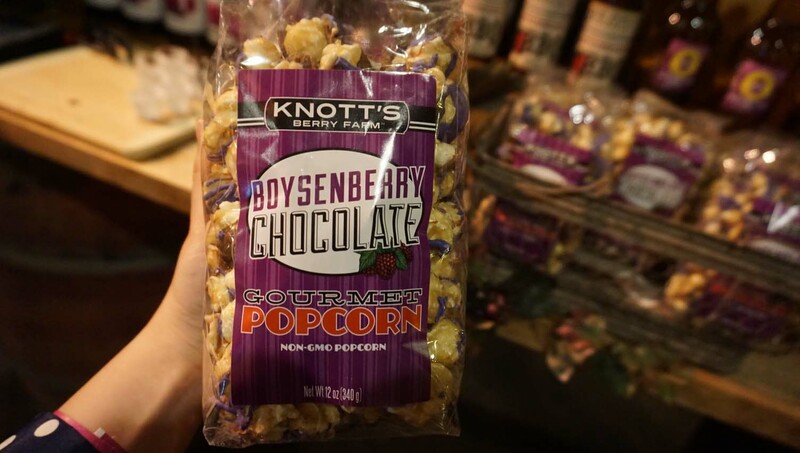 What you can get your hands on this year at the Knott's Berry Farm Boysenberry Festival! My favorite! I’ve never had alligator meat before so Knott’s popped my cherry! Alligator, to me, tastes like a fishy chicken. The texture is sorta strippy like fish but the taste is like chicken! Pretty good and interesting to try! 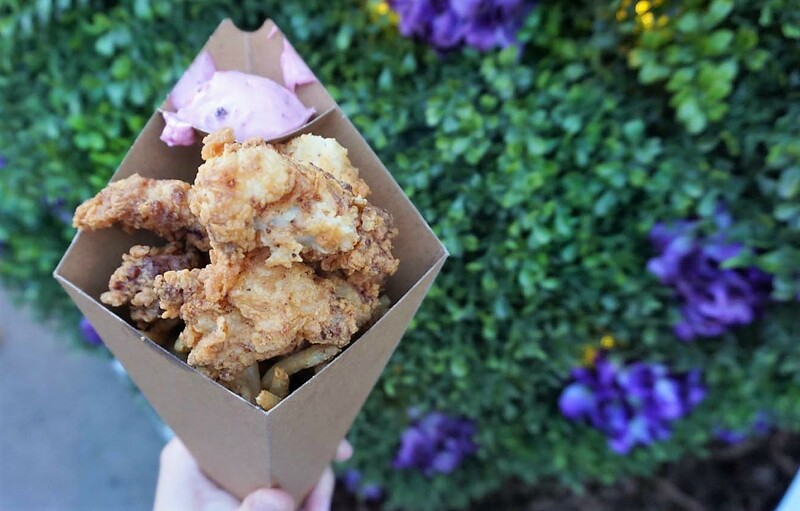 The boysenberry aioli sauce is also creamy and reminds me of garlic aioli sauce. SO GOOD JUST TRY IT Y’ALL! Another recommended item! You can taste the boysenberry but it’s not too strong or overpowering. It’s kinda like honey bbq but with boysenberry instead. Sweet and tangy! Yum! These meatballs are huge! They aren’t yo avg meatballs either. 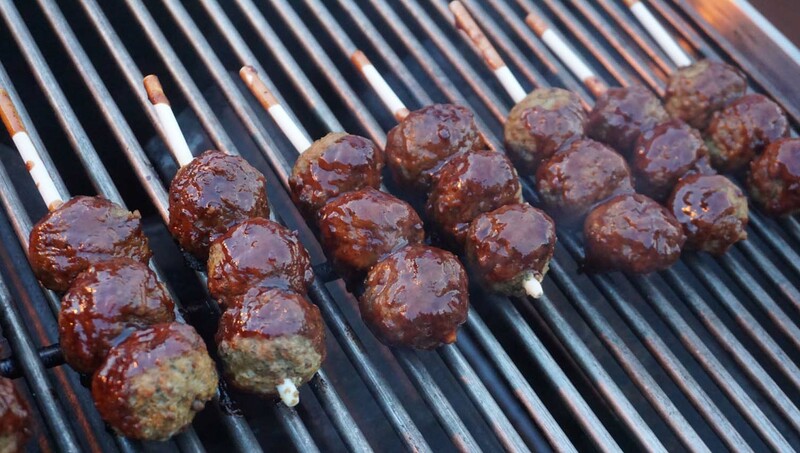 They are made with beef and are tender and soft and moist and go well with the boysenberry! 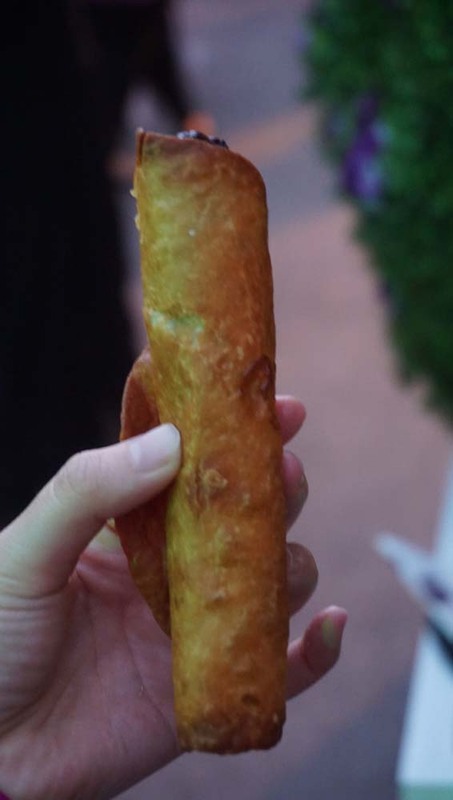 I love cheesecake and this is a fried cheesecake on a stick! It’s pretty good! 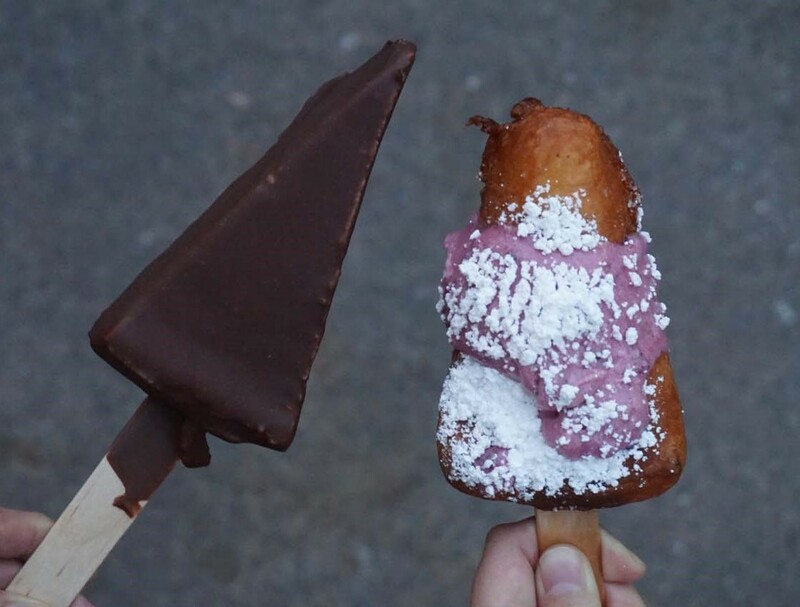 I think this is cool but I prefer the fried version over this chocolate dipped version! OMG! I TOTALLY RECMMEND THIS! It’s perfectly done! The crepe is a soft crepe and has such a good sweet vanilla cream that’s airy and fresh! 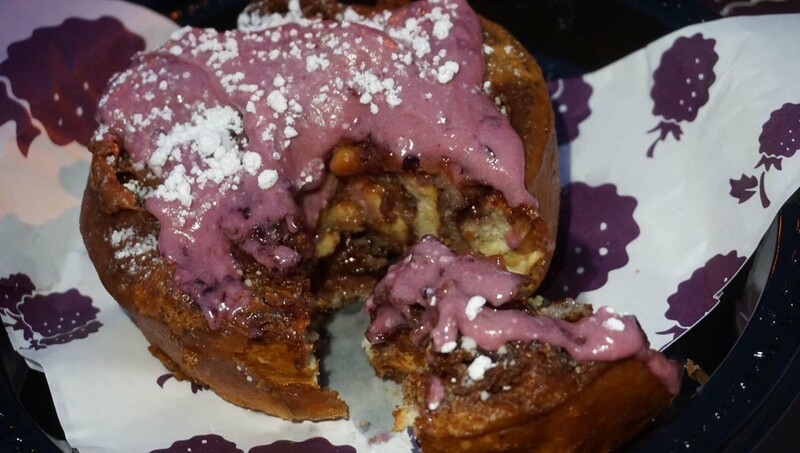 It’s filled with Nutella and drizzled with boysenberry sauce which adds that perfect touch! Nothing is too overpowering here and I would hands down get this again! Interesting but too much bread and too much jam. Will get boring easily unless you are sharing with a lot of people and eating only bits. This actually tastes like boysenberry according to Kevin’s cousin (we brought him leftovers, LOL). I am not a fan of Goat cheese but this wasn’t overpowering at all. 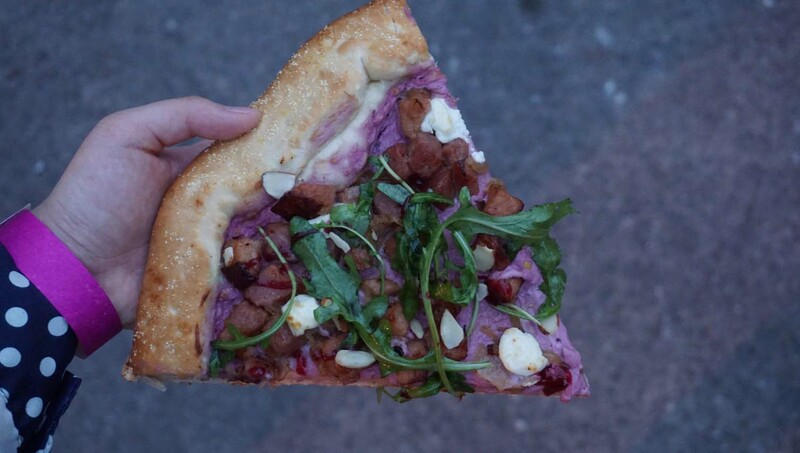 The entire pizza is interesting and worth a try. However, I do think it has too much dough so it’s feels very “bread-y” with every bite. I don’t know about this one. It was interesting… There is a lot of sauce and the entire dish tastes like mushy pasta? It’s very purple which is cool looking! I didn’t get to try this but panna cotta is usually a good choice! OMG THIS IS HEAVEN IN A GIGANTIC CINNAMON BUN FORM! I recommend this to be shared with like 4 to 6 people because it is huuuge. It is one of their most popular and iconic items. I love how cinnamon-y it is and it is incredibly soft and moist when fresh. SO GOOD! Haven’t tried this yet but corn…on the cob? I will be getting this when I attend the festival next week for sure! 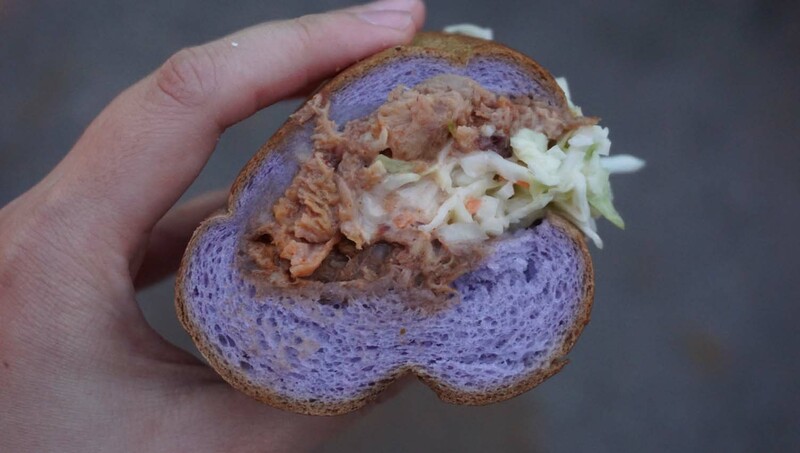 The bread is a purple color! How cool! You can’t really taste the boysenberry much though but the sandwich itself is yummy! I love the pulled pork and coleslaw together! Too oily in my opinion. 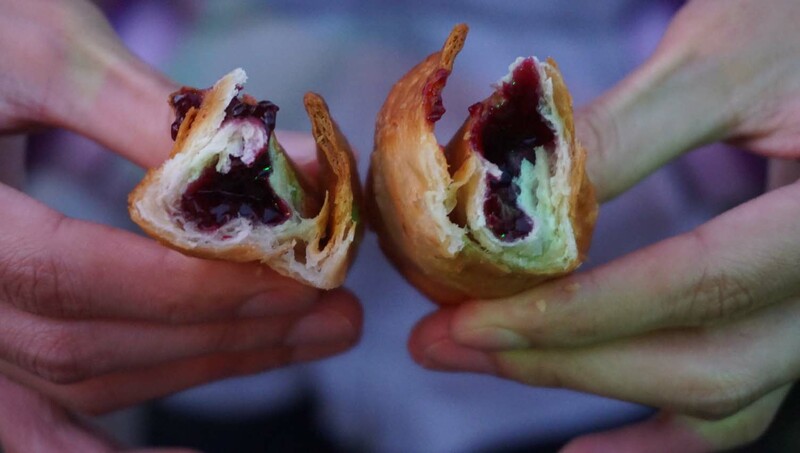 One bite has boysenberry jam gushing out! Great if you love the jam but unfortunately, I think it’s more of a “filler” item. OMG I recommend this too! The corn dog bread/flour is infused with boysenberry so it is slightly sweet. The meat itself is 100% beef so woo woo! 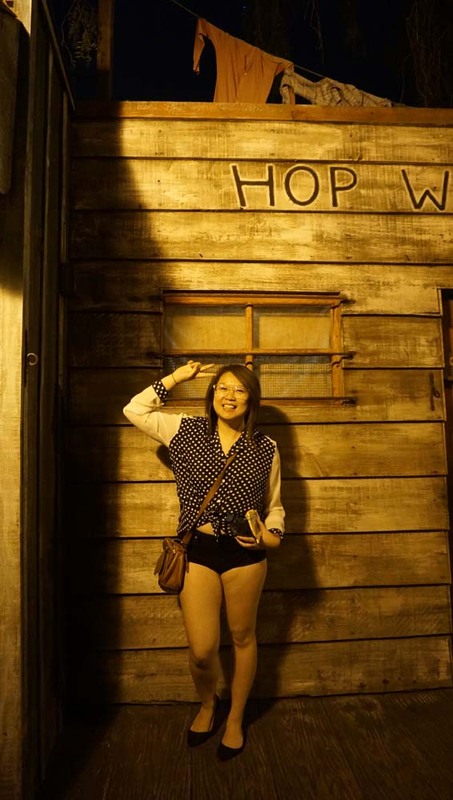 Overall, very yummy! Boysenberry Frappuccino and Latte exclusively sold at Starbucks only inside Knott's! Haven't personally tried but heard really great things about it! That's not even all of it! 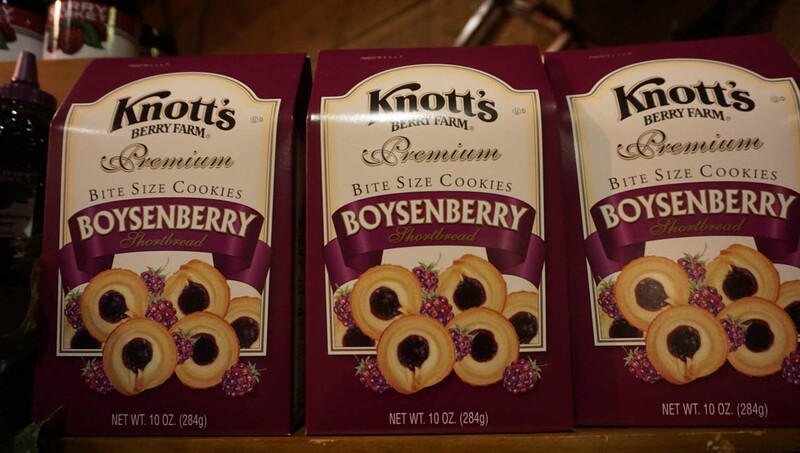 There are over 70 creative boysenberry themed treats! One of the best ways to experience the Boysenberry Festival is with a Boysenberry Festival Tasting Card. 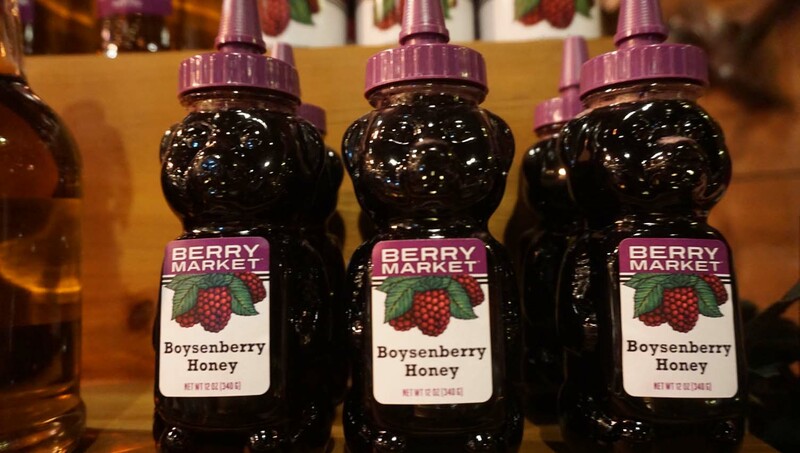 The Boysenberry Festival Tasting Card can be purchased online or at the following locations at the park: The California Store, Little Spurs, General Store, Ghost Town Candy, Gold Trails Hotel, Spurs Chophouse, Pemmican Pickle, Calico Saloon, Ghost Town Bakery, Sutter's Grill, and Ghost Town Mix-it-up. If you buy tickets to the theme park in person, it'll cost $75 which is a lotta money when you can save so much more money if you buy online! Obviously, plan your day ahead of time to decide which day you wanna go and buy online!! You will need to buy admission tickets to the actual park to get access to the Boysenberry Festival. To try the food, you can buy the Boysenberry Festival Tasting Card which is $25 to try their set selection of food. As for the other delectable goodies, they are separately priced! Best of all, the tasting card is shareable within your group! No need to buy a tasting card each person. Just buy 1 card for your group of friends which is probably enough food to feed 2 people or more! And then y'all can decide what else to buy which is sold separately! Hope this guide helps ya! 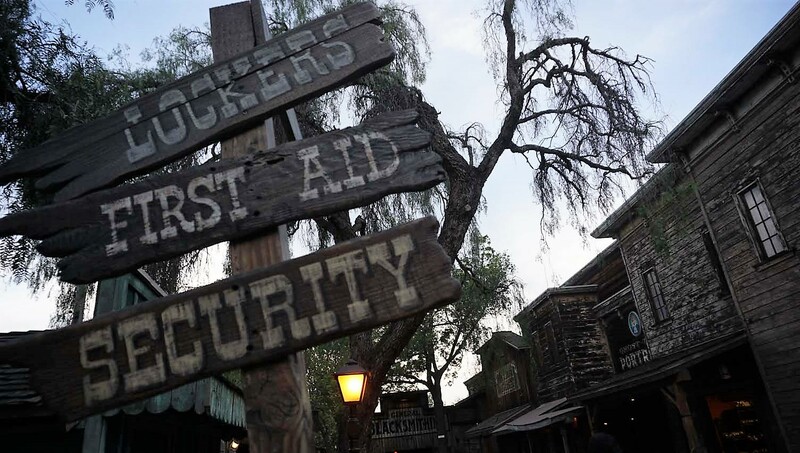 I will be visiting Knott's Berry Farm again on April 1 so lookout for some awesome sneak peaks on the Instagram! I will also be posting up prices too for the rest of the stuff once I find out when I go! HAVE A BOYSEN-BERRY GREAT DAY!